I had this great plan. 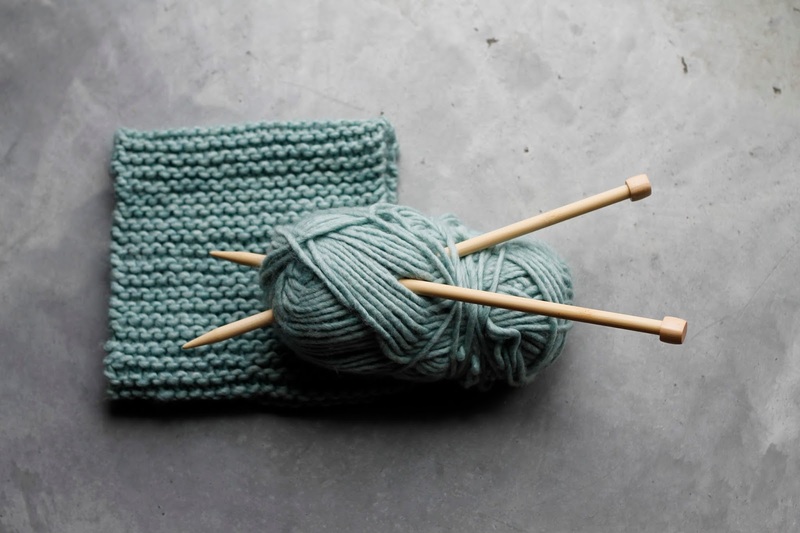 I was going to start knitting, and stop feeling guilty when all I want to do is spend the evening on the couch, watching TV with a glass of wine. It was going to be delightfully productive. I would be able to catch up on all these shows, and make pretty things. First I asked my mom to teach me. She pulled out old knitting needles, gave me this pair of plastic needles and this old wavy yarn. I did not get it. I made some sort of mess, and wasn't even drinking or watching TV. I gave up knitting for a while. Then I was visiting my in-laws, and asked my lovely sister-in-law to teach me. She had impressed me the summer before by making me a cute hat in no time. We went to Michaels, picked up these giant needles and this pretty coloured yarn. It went... ok. It was great as long as she was right there next to me. I still didn't really understand what I was doing, and would panic when something would go wrong and give it to her to fix. Since she is so nice, she would fix it for me, even try to show me what had happened. Most times, we had no idea what I had done. But I was knitting. Then I got home, and it didn't really make sense anymore, so I decided to sign up for a class at my favourite local independent yarn store. And then I got it. Here are a few things I've learned, as well as some wise advice I received during my class. Don't expect to watch TV and knit. For a while. Forget the wine. Unless it's an emergency, don't put down your knitting in the middle of a row. For a while. 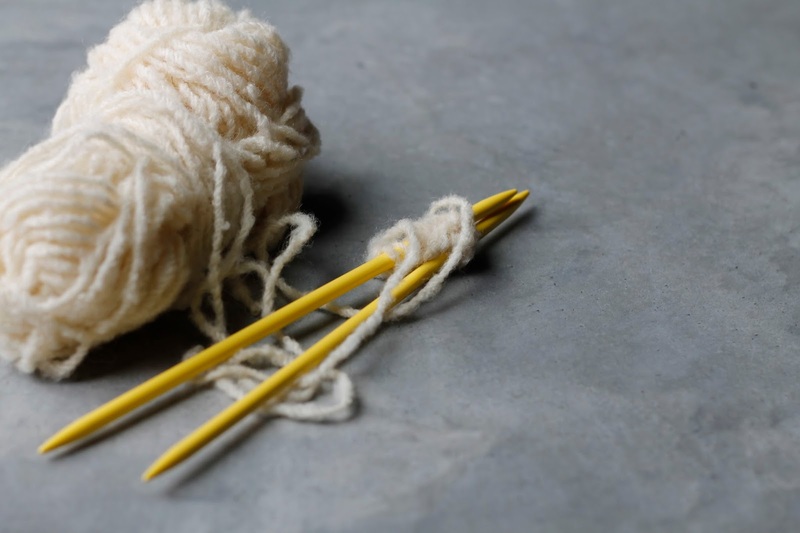 You'd be surprised how easy to is to start knitting the wrong way. Buy new knitting needles. Forget the plastic or old metal ones. Wood works best because it's not as slippery. I learned on circular needles, and like it. Whatever works for you. Buy good yarn. Cheap acrylic yarn splits easily, and makes errors a lot more likely. Then you end up with more stitches then you started with, and nothing makes sense anymore. Cascade 220 is a good basic worsted weight wool to start with, and easy to find. Buy a light-coloured yarn, it's easier to see your stitches. You'll make less mistakes. Practice the stitches instead of starting on a project right away. You will make mistakes, if you are like me, you will make tons, and it is way more frustrating if it's on your next favourite scarf/hat. Plus, once you master the basic stitches, you can reuse the yarn for something more exciting. Relax and enjoy. No need to pull everything extra tight. You will end up with cramps in your fingers/hands. At least I did. I haven't knitted in ages because I am notorious for starting projects and never finishing them. And, like you said, it is so easy to forget which way you were knitting and then ruin the row/project. Which means I often had weird sloppy not the way I wanted them things. I need to get back into it....especially because I have gobbs of yarn hanging out just collecting dust. Oddly enough, I prefer metal needles -- I tend to pull too tight and I find my tight stitches move more easily on metal. Hi Michele, I hope that this inspires you to start knitting again! Interesting about needle preferences. I found that my stitches were slipping off too easily on metal ones, which is probably why wood works best for me.